Windows 8 PC sales start Friday with major online retailers including Best Buy, Dell, Staples, Tiger Direct, and yes, the Home Shopping Network taking pre-orders for Windows 8 PCs and tablets. Some retailers are promising free shipping and delivery on October 26, also known as Windows 8 launch day. It's not clear if Microsoft is allowing select partners to offer Windows 8 PCs on Friday or if all computer resellers will start to roll out Windows 8 pre-orders in the coming days. Major online store fronts such as Amazon and Walmart were not yet offering Windows 8 devices at the time of this writing. If you want to be one of the first on your block with a PC built for Windows 8, here's a quick look at some of the highlights offered online. If you pre-order a Windows 8 PC from Best Buy before noon Central/1 Eastern on Wednesday, October 24, Best Buy will give you free shipping on your offer and deliver your item on October 26. You can order items such as the Hewlett-Packard Envy h8-1414 desktop PC for $700 with 3.5GHz AMD FX processor, 10GB DDR3 RAM, 1 TB hard drive, AMD Radeon HD 7450 graphics with 1GB dedicated memory, Ethernet, 802.11b/g/n Wi-Fi, DVD drive, and 2 x USB 3.0. HP in late September announced several new Windows 8 PCs including the upcoming HP Envy Phoenix h9 desktop. You can also pick-up the recently announced Acer M5-581T Ultrabook available exclusively at Best Buy. The laptop features a 15.6-inch screen with 1366-by-768 resolution, 1.7GHz Intel Ivy Bridge Core i5 processor, 6GB RAM, 520GB HDD, 802.11b/g/n Wi-Fi, 2 x USB 3.0 and one USB 2.0, HDMI out, and 64-bit Windows 8. The Ultrabook weighs 5.1 pounds and is priced at $600. Best Buy was not yet selling the M5-481PT, a 14-inch Ultrabook featuring a 10-point multi-touch display. 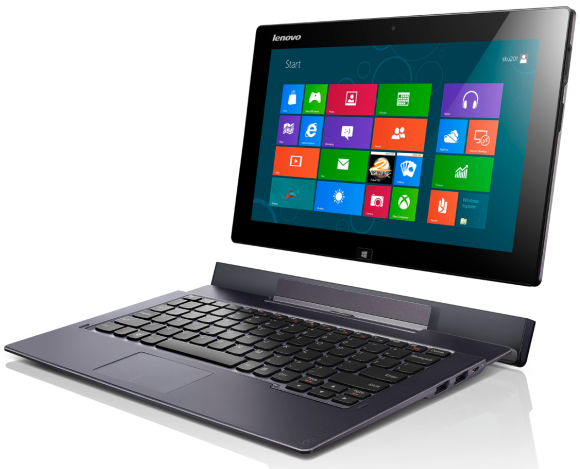 Best Buy is also offering the Lenovo IdeaPad Yoga 13 for $1,000 featuring a 13.3-inch screen with 1600-by-900 resolution, 1.7 GHz Intel Ivy Bride Core i5 processor, 4GB DDR3 RAM, 128GB SSD, 802.11b/g/n Wi-Fi, one each of USB 3.0 and 2.0 ports, and 64-bit Windows 8. You can also get Windows 8 devices from Asus, Dell, Gateway HP, Toshiba, Samsung, and Sony at Best Buy. If you pre-order a Windows 8 PC or tablet with Staplesbefore October 25, the office supplies chain will deliver your new device between October 26 and October 31. Staples is not promising free shipping or guaranteed October 26 delivery. But anyone who orders a Windows 8 PC from Staples priced at $699 and above will receive free data transfer service from their old computer. You can get your hands on the Asus Vivo Tab TF600 for $600 featuring a 10.1-inch IPS display with 1280-by-800 resolution, quad-core Nvidia Tegra 3 1.3GHz processor, 32GB storage, 2GB RAM, Webcam, 8 megapixel rear-facing camera, Bluetooth 4.0, 802.11b/g/n Wi-Fi, SDHC card reader, and Windows RT. The TF600 weights 1.1 pounds and is 0.3-inches deep. You can also pre-order the Vivo Tab's keyboard dock for $170. Ultrabook fans can pre-order the $850 HP Envy Ultrabook 4-1130us featuring a 14-inch display, 1.7GHz Core i5, 6GB DDR3 RAM, 500GB HDD, 32GB SSD, 2 x USB 3.0, 1 x USB 2.0, HDMI out, and 802.11b/g/n Wi-Fi. HP's Envy Ultrabook weighs 3.86 pounds and measure 0.78-inches thick. Another much-discussed device available at Staples is the 11.6-inch Samsung Series 5 slate for $650. This dockable tablet features 1366-by-768 screen resolution, 1.5GHz Atom Z2760 ( Clover Trail) processor, 64GB SSD, 2GB DDR3 RAM, 802.11a/b/g/n Wi-Fi, Bluetooth 4.0, micro HDMI, USB 2.0, and 64-bit Windows 8. The keyboard dock for the Series 5 is sold separately, but Staples was not offering it at the time of this writing. Tiger Direct is selling a number of HP Probook laptops ranging in price from $600 to $680 featuring 14- or 15.6-inch screen sizes. You can also check out the Home Shopping Network's selection of Acer, Gateway, and HP computers, many of which were discussed earlier in the week. Finally, Dell is offering several Windows 8 devices for pre-sale Friday including the XPS 12, XPS 13, XPS One 27, and Inspiron One 23. The XPS 12 Convertible Ultrabook is one of the most talked about Windows 8 devices, because of the unique flip-hinge design that lets you turn the screen a full 180 degrees to convert the laptop into a tablet. Pricing for the XPS 12 starts at $1200 featuring a 12.5-inch touch screen, 1.7Ghz Intel Core i5 processor, 4GB DDR32 RAM, and 128GB SSD. 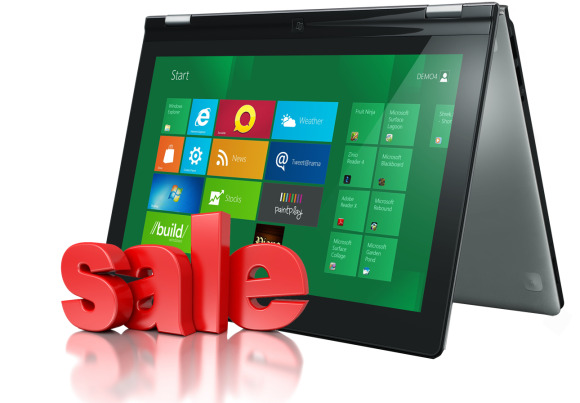 Windows 8 pre-sales come after the Home Shopping Network on Monday jumped the gun and mistakenly started early sales of Acer and Gateway Windows 8 devices.